Home/Restorations, Uncategorized/Camel Adoption, a Great Success! a giving program at the Lightner Museum, provides new opportunities for those who would like to give to the museum, by allowing them to donate funds that go directly towards the restoration of items in the museum’s collection. The “adoption” can be given as a gift, or in memory of a loved one, as was the porcelain camel figurine adopted by the children of long-time museum volunteer Sue Howden. Sue Howden served as a volunteer at the Lightner Museum, faithfully running the front desk every Wednesday afternoon until her passing in 2016. Those who worked with her at the museum remember her for being an assertive authority at the front desk and always wearing her favorite amber earrings, which were so fitting to the museum’s collection. Her children knew her passion for the museum and wanted to do something to keep her memory alive. On the anniversary of her death, her children, Brinton Hevey and Elise Batchelor, went on the Lightner’s website knowing how much she loved volunteering there. 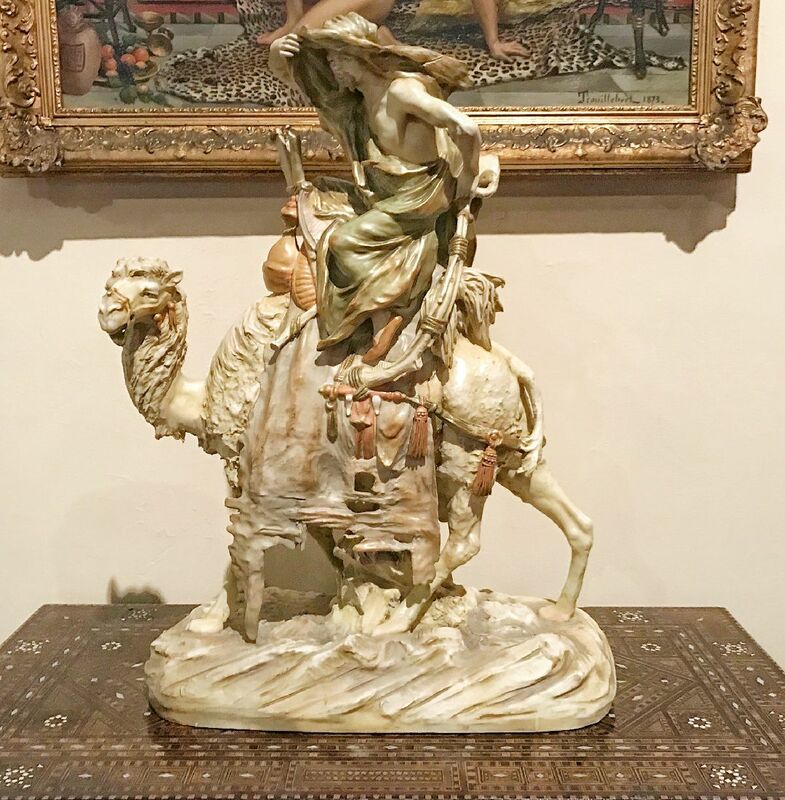 When they learned of the “Adopt an Artifact” program, they decided to fund the restoration of the porcelain figurine, Camel and Rider, in Sue Howden’s honor. Museum Director Robert Harper remembers her quick-witted one-liners that were direct, to the point, and received with humor. Sue was also well liked and respected by all staff members and volunteers at the museum for her unbiased judgment and honest work ethic. The figurine sat in storage for over four decades due to damage around the camel’s feet and legs. Made by Amphora Porcelain Works in Teplitz, Austria, Camel and Rider dates to circa 1900 and is part of Otto Lightner’s original collection. Brinton Hevey and Elise Batchelor donated about $1,100.00 to be used for the restoration of this magnificent porcelain figurine. Camel and Rider was sent to be restored by Luba Sokolina at Luel Restoration Studio in New York the summer of 2017. Sokolina is an internationally renowned porcelain and ceramic expert. Born in Moscow, Russia, she worked for several years for a Moscow film studio before moving to the United States in 1990. Sokolina’s expertise includes restoration and conservation of ceramics, porcelain, majolica, terra cotta, china, pottery, dolls, and glass. For more information about Luel Restoration studio, visit Luelstudio.com. Camel and Rider is now proudly displayed in the Egyptian Room of the Dressing Downton™ exhibition alongside hundreds of pieces from the museum’s collection, many of which have also been “adopted” by generous donors. After the special exhibition ends, Camel and Rider will remain on display in the museum’s permanent collection. A special thanks to Brinton Hevey and Elise Batchelor for making it possible for the Lightner Museum to display this amazing figurine in our current exhibition, and for years to come. Sue Howden’s memory lives on at the Lightner. Another original piece in the museum’s collection is in need of adoption. Winged Mercury is a bronze statue created after the masterpiece, Giambologna, circa 1890. This magnificent but broken bronze statue has been languishing in storage for over four decades. Mercury’s broken base depicts Father Wind and is in need of repair. He would look much more fitting displayed in one of the museum’s opulent courtyards. For more information about adopting Winged Mercury, please visit www.lightnermuseum.org/winged-mercury or contact 904-824-2874 ext. 100, or email give@lightnermuseum.org.